A decorated Korean War hero inexplicably collaborates with the enemy while interred in a POW camp and is court-martialed. In 1868, American inventor Victor Barbicane develops a powerful military explosive that he also uses as fuel for a moon-bound rocket manned by himself and a motley crew. Torch singer Helen Morgan rises from sordid beginnings to fame and fortune only to lose it all to alcohol and poor personal choices. An all-star, large scale epic film that chronicles the life and ministry of Jesus Christ. Dave Hirsch, a writer and an army veteran winds up in his small Indiana hometown, to the dismay of his respectable older brother. He meets and befriends various different characters and tries to figure out what to do with his life. John Steinbeck introduces a quintet of five of O. Henry's most celebrated stories from his New York Period (1902-1910) in this anthology film. During WW2, husband-less New Zealand women meet and marry American soldiers who are fighting in the Pacific theater. Boxer Rocky Graziano's biopic, based on his autobiography, from childhood to his World Middleweight Championship title win at age 28 in 1947. Epic and religious story based on a novel by Thomas Costain and dealing with the momentous deeds that befall a young Greek artisan called Basil (film debut of Paul Newman , though James Dean was offered the character, but he and his agent thought the script was poor) is commissioned to cast the cup of Christ in silver and sculpt around its rim the faces of the disciples (Lucas played by Alexander Scourby , Peter acted by Lorne Greene ..) and Jesus himself . Later on , he returns Rome where he meets Apostle Peter . This Biblical extravaganza turns out to be a religious mammoth epic and focuses a moving Roman pageant dealing with a Greek sculptor , following his stirring career , spiritual awakening and reaches an exciting peak at the ending . This is a spectacular but failed portrayal of Biblical Hollywoodiana in which only flashes of the brilliance to come emerge from some amazing scenes . In its way , it was Warner Brother's answer to ¨The robe¨, being a misfire in which about to go bankrupt the production company . It has marvelous images , spectacular scenes , average performances as well as a lot of cast of thousands . However , the picture resulted to be a bloated , turgid Biblical epic , a real failure at box office . When the film ran on television in 1966, Paul Newman , who was a little wooden , took out ads in the Hollywood trade papers, and in Variety magazine , calling it "the worst motion picture produced during the 1950s," apologizing for his performance, and asking people not to watch the film . Unfortunately, it had the opposite effect, and many people tuned in to watch it on TV . Newman once screened the movie for friends at his home, giving them whistles , pots, and wooden spoons, and encouraging them to make noisy critiques of the film. Paul Newman, who was a finalist for the role of Cal Trask in East of Eden (1955) that eventually was played by Dean and made him a star, took the role, which Newman later regretted . While shooting "East of Eden," Dean went over to visit Newman on the set of this film, where he met the love of his short life, Pier Angeli, Newman's co-star . A 15-year-old Natalie Wood who interprets Mayo's role when younger gives sensitive acting , though brief . The best acting comes , indeed , from Virginia Mayo as helper to Simon the Magician performed by an overacted Jack Palance . The supporting cast also includes E.G. Marshall as Ignatius , Michael Pate as Aaron Ben Joseph , Ian Wolfe as Theron , Lawrence Dobkin as Ephraim , Walter Hampden as Joseph of Arimathea , Joseph Wiseman as Mijamin and Albert Dekker as Kester . Furthermore , film acting debut of Lorne Greene and Robert Middleton . Alexander Scourby, who plays St. Luke, was known for his deep, rich voice and later became the first person to read and record the entire King James version of the Bible on records. Sensitive and lyric musical score by the classic Franz Waxman . Colorful and glamorous Cinematography by William V. Skall . Strange and innovative production design by Rolf Gerard , including monumental as well as rare sets , in theatrical style . The motion picture was regularly directed , this was final film as director for Victor Saville . He moved to Hollywood in 1939, where he acted primarily as producer, though he did direct one more A-grade film , Green Dolphin Street (1947). He directed several movies such as Storm in a Teacup , South Reading , If Winter comes , Calling Bulldog Drummond and especially his successful ¨Kim ¨. 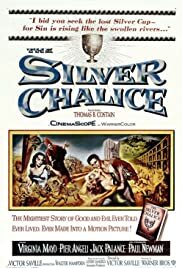 Though briefly touted as a possible successor to Louis B. Mayer at MGM, the massive critical and artistic failure of a decidedly stodgy and miscast biblical epic, The Silver Chalice (1954), hastened Saville's eventual retirement from the industry .